PC Technika is happy to offer our customers the best solutions for keeping their networks and PCs safe and secure. We know that in today’s times, all businesses and individuals need solutions that are tailored to their needs. For this reason, we both design and implement systems that meet your specific requirements, including Access Control Systems. An access control system is made up of both hardware and software that work in unison to allow people into and out of your business or other areas. The system can allow people in, or it can keep people out; this is the beauty of access control. You can choose which people are allowed access to specific areas and which are not allowed to be in those areas. The hardware includes a door-locking mechanism that our technicians connect to a card reading unit that is typically close to the actual door that requires card access. When you give an access card, (about the size of a credit card) to an employee, vendor, or other person, that person can access that door and anything that lies beyond it with a simple swipe. If a person needs in the door, a card is required. 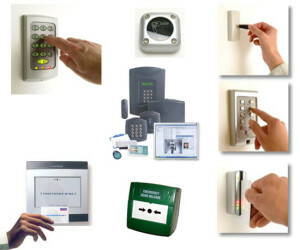 Why Should You Use Access Control in Your Business? 1: The system allows only authorized persons to access a specific area of your business on demand or at a designated time. 2: You can opt to program the system to allow access for a specified time period. For example, you may want employees to be able to access the back office for two hours after closing time only. This ensures that people are unable to access the area whenever they choose, and it keeps the in/out activity at your place of business to the bare minimum. This type of system limits access of sensitive areas within your business. Maybe you don’t want employees in the store room or the office. With an access control system, you decide who comes into specific rooms in your office or who gains access to your building and when. 3: Access control systems help you hold others accountable for theft and vandalism. Employees can be held to a higher liability standard when they have access that other employees do not. Each time an employee’s card is swiped to enter and exit an area, he creates a digital footprint. If problems occur, the access control system may be used to pinpoint the employee who was in the area at the time of the incident. Used in combination with CCTV Security Cameras it’s an even bigger theft deterrent. When we design an access control system, our work begins with discussing your particular needs and the goals you have for controlling access. We plan out the system that you describe, install it, configure it, and then train staff members in using it – all within the time frame you establish. We take great pride in fast and efficient installation, complete setup, and easy-to-understand training for your staffers. Contact us today to find out more.